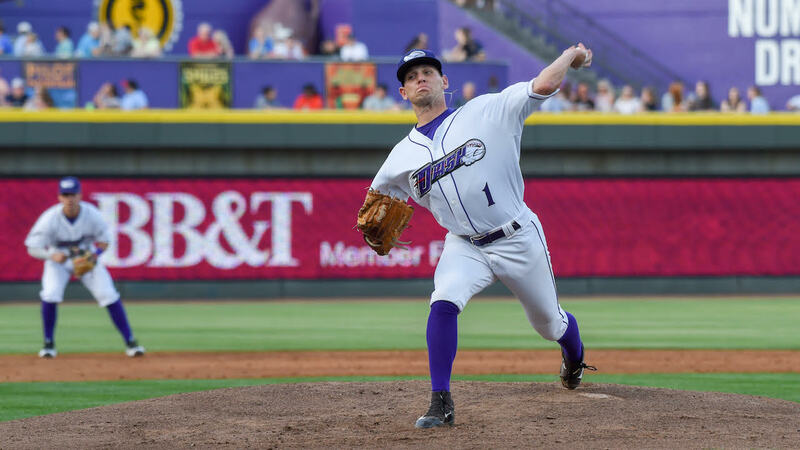 WINSTON-SALEM, N.C. (April 13, 2019)- Led by a fantastic start from left-hander Kyle Kubat and a four-hit performance from top prospect Nick Madrigal, the Winston-Salem Dash shut out the Potomac Nationals 4-0 on Saturday night at BB&T Ballpark. Kubat (1-0) worked six innings, allowing just two hits while striking out five in earning the win. Meanwhile, Madrigal tied a career-high in hits by going 4-for-4 with a double and two RBIs. Along with Madrigal, Winston-Salem (5-5) benefitted from another strong performance by Luis Robert. Robert went 3-for-4, scoring three runs and finishing a home run shy of the cycle. Robert has now posted eight multi-hit efforts in nine games played. The Dash got off to a quick start offensively. Robert led off the ballgame by depositing a double into left-center field. After a Madrigal single, Robert came home as Jameson Fisher grounded into a double play to make it 1-0. Kubat was cruising from the outset against Potomac (4-6). He retired the first six hitters he faced, recording three strikeouts in that span. Between the third and fifth innings, Kubat retired nine straight Nationals hitters. Winston-Salem added to its lead in the bottom of the fifth. Jordan George singled to lead off the inning, and he came around to score on a double play by Daniel Gonzalez to give the Dash a 2-0 lead. Following the double play, Robert and Madrigal helped bring home another run. After Robert reached on a broken-bat single to center, Madrigal drove him in by chopping a double into left field to make it 3-0. The two-run fifth ended the day for Potomac starter Nick Raquet (1-1). The dynamic duo combined for another two-out rally in the seventh. Robert smoked a triple off the right-field wall and came around to score on a single by Madrigal down the right-field line to extend the lead to 4-0. After Kubat departed following the sixth, the bullpen continued to shut down the P-Nats offense. In two innings of work, right-hander Jose Nin struck out four and held Potomac without a hit. Will Kincanon finished off the game with a hitless ninth. Winston-Salem concludes its home series against Potomac on Sunday at 2 p.m. Left-hander Cristian Castillo (0-0, 1.80 ERA) will take the mound for the Dash. Potomac will send righty Malvin Pena (0-1, 16.88 ERA) to the bump. First pitch is set for 2 p.m., and fans can catch all the action on wsdash.com/broadcast, MiLB.tv and the TuneIn Radio App. Pregame coverage begins at 1:45 p.m.
Sunday will be the first Rayados Day of 2019 (presented by Univision) and a Craft Fair will be held at the ballpark. For tickets and more information, call the Dash at (336) 714-2287 or visit wsdash.com.